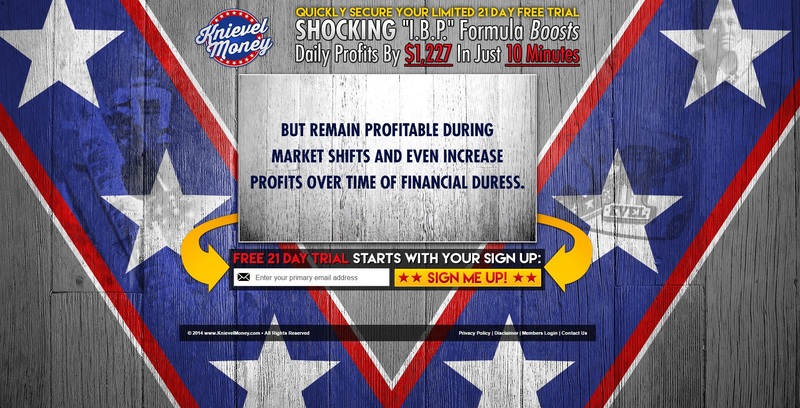 In this Knievel Money review you will learn that this binary options program is a scam. It is presented by Jason Evans. Evans says that Knievel Money is an automated trading software that can make you more than one thousand dollars per day. And now you can get Knievel Money for free. That’s it, free money, life is easy. Is it really? The truth is that Knievel Money is a scam. Evans is a scam artist that made up a story about a system that does not exist. It is just a fairy tale. This program will not make you any money. In fact the opposite will happen, it will lose your hard earned money. Here is the proof. We have reviewed hundreds of binary options scams and we know pretty much every software that scammers use. And Knievel Money is based on one of them. The software used by this program is very well-known in this industry, it was created by scammers and it is used by scams only. Look at the picture on the right and you will see some examples of other scams based on the same app, like Swiss Binary Robot, Binary Godfather and Cognitrade. And thanks to feedback from real users we know that this software is losing money in real trading! The real purpose of Knievel Money is to make you deposit money with a selected broker. So when you sign up for the program, they will create an account with a broker for you and ask you for a deposit. You won’t be allowed to use the software until you deposit money, so it is not free. The reason is that scammers behind this program are getting paid by this broker for referring new depositors. That’s all. And as we said, if you really deposit and let Knievel Money trade with your money, you will lose it. Knievel Money is very basic scam designed to make you deposit and to lose your money through a scam software. Stay away from it. To make money with binary options you have to learn to trade and build a profitable strategy. You can try and do it on a free demo account with a regulated broker.